A Unique PHP Script Turn your website Into a Microjob site . 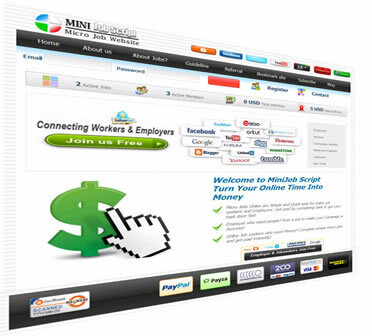 MiniJob have all features same as Microworkers & PTC & Fiver sites within One script power. 28 international currency supported +Can be run with your own currency or points/coin system! MiniJob 2.1B is a Unique PHP Script let you start a job website like fiver ,microworkers, Freelancer, PTC etc..
With MiniJob script you an create a Real professional website like Microworkers & PTC & Fiver at One platform. 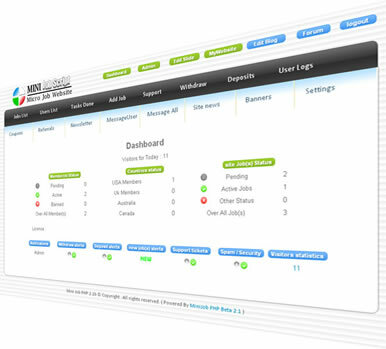 Whole process for Campaigns and Payments auto controlled / Managed by MiniJobScript. multi plus options also they can deposit instantly. campaign as fiver, Great benefit for members and admin . Best feature for Advertisers as always. or Virtual system like Point / Coin system. or other earh engines, let's get your site with high rank. Copon system give more attraction for quick site establisment . Built-In blog let you have Own blog without any extra script. you can assign multi moderators from members. Just Contact us now for any question. List of Some hot Jobs sites Powered By Mini Job Script!